This rich and buttery candy favorite, topped with creamy chocolate and chopped nuts, is sure to please. Line the baking sheet with aluminum foil, place soda crackers on foil to cover entire bottom. In saucepan, melt butter and light brown sugar until it boils, stirring contantly. Let boil for 3 minutes; continue to stir so not to burn. Remove from heat and let stand one minute. Pour the butter mixture evenly over the soda crackers, smooth out to edges with a spatula. Place in oven for seven minutes, watch closely so the toffee does not burn. 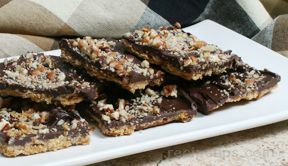 Remove from oven and immediately sprinkle the chocolate chips over the toffee, spread with a spatula to even out to the edges. 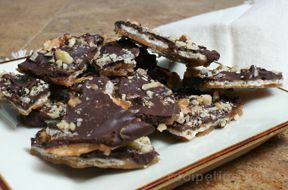 Sprinkle chopped nuts over the top of the chocolate and press down into the mixture. Place in refrigerator until it hardens, or place in freezer to hasten the hardening. 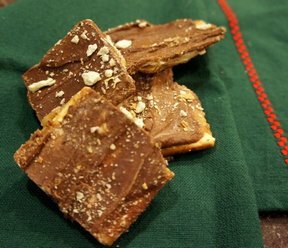 Once the toffee hardens, remove tin foil from back and cut or break into bite size pieces. Store in the refrigerator or freezer in a covered container. "Very easy recipe. 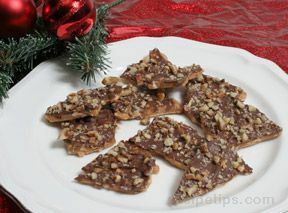 I will be making this one for my Christmas cookie platters"